You know that annoying expression wannabe free-spirits throw around about how "it's not the destination, it's the journey, maaaaaan"? Well, when it comes to super tricked-out elevators that star as stand-alone tourist attractions, they're kind of right. Here are eight contraptions designed outside the proverbial metal box, with views so spectacular they're worth traveling to for the ride alone. 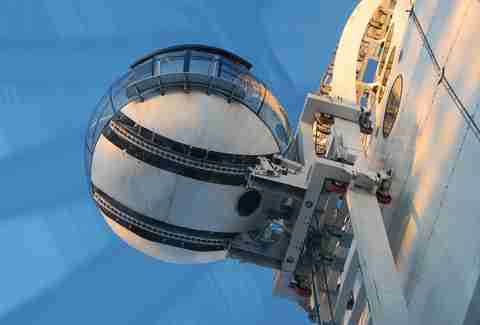 This glass gondola takes passengers to the top of the world's largest spherical building, the 279ft Ericsson Globe. 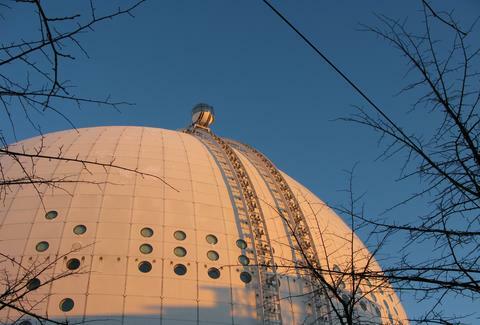 The ride offers a virtually unobstructed view of Stockholm and all 17 of the country's IKEAs. Ok, maybe it's not that tall. Why make your way to the bar when the bar can come to you? 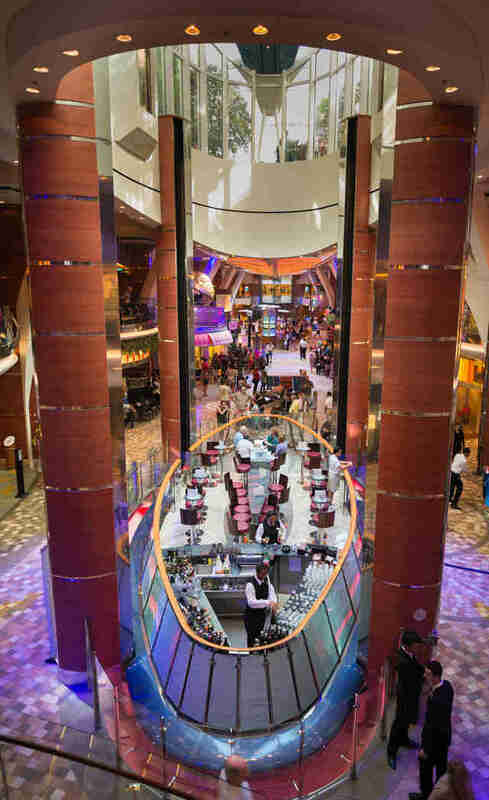 That's exactly what the execs at this cruise company had in mind when they created a 35-person floating elevator bar to connect the Central Park deck to the Royal Promenade. Grabbing a drink while rising gently through the air on an open-topped platform has never been this easy! 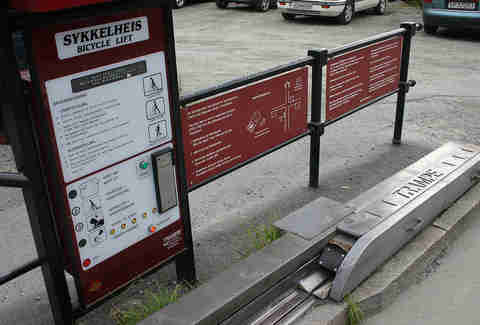 An elevator that puts its passengers to work, the Trampe Bicycle Lift in Norway was built to promote commuter cycling. It's also the only bicycle elevator in the world, which probably isn't that surprising to anyone. Are you feeling a bit dizzy from too many shots at Playbar, or is it because of the elevator? Hmmm... 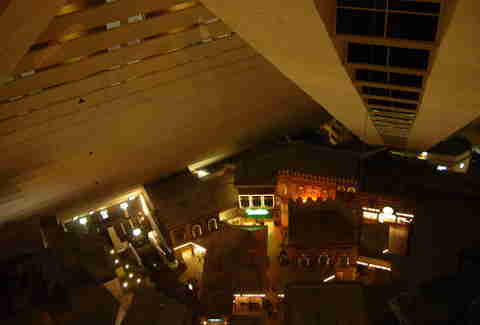 Thanks to the Luxor Hotel's pyramid shape, the “Inclinator” travels 30 floors at an incline of 39 degrees, so it might just be a subtle mix of both. 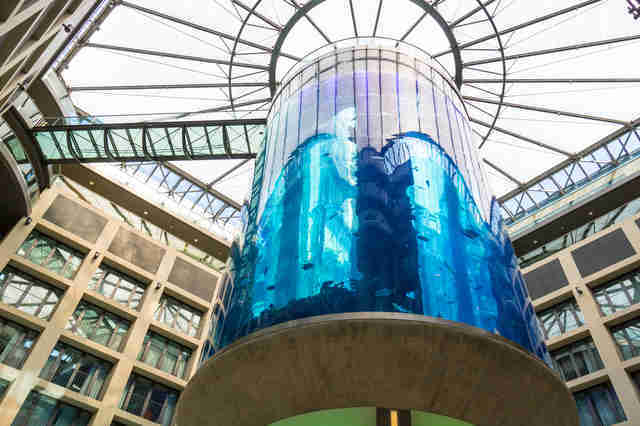 The glass-walled lobby elevator at Berlin's Radisson Blu hotel is actually encircled by the world's largest cylindrical aquarium (100ft), home to over 50 species of fish and marine wildlife. This might be the only place in the world where you can get seasickness and vertigo at the same time! Designed to ensure you don't actually have to do any hiking at all, this Swiss outdoor elevator travels 3,778ft up to a lookout point that offers stellar unobstructed views of Lake Lucerne. Hammetschwand's the highest exterior elevator in Europe, evidenced by the fact that the view can be obscured by freaking clouds. If you looked up "state-of-the-art intuitive interaction" in a dictionary of really long words/ phrases that sound impressive, you'd see a picture of the elevator at QT Sydney. It senses how many people are in it, then plays music based on the number of passengers. One passenger'll yield something slow (maybe Adele?). A big group enters, however, and suddenly it's party time with Katy Perry -- whether you'll actually start dancing in a box full of strangers is another question entirely. 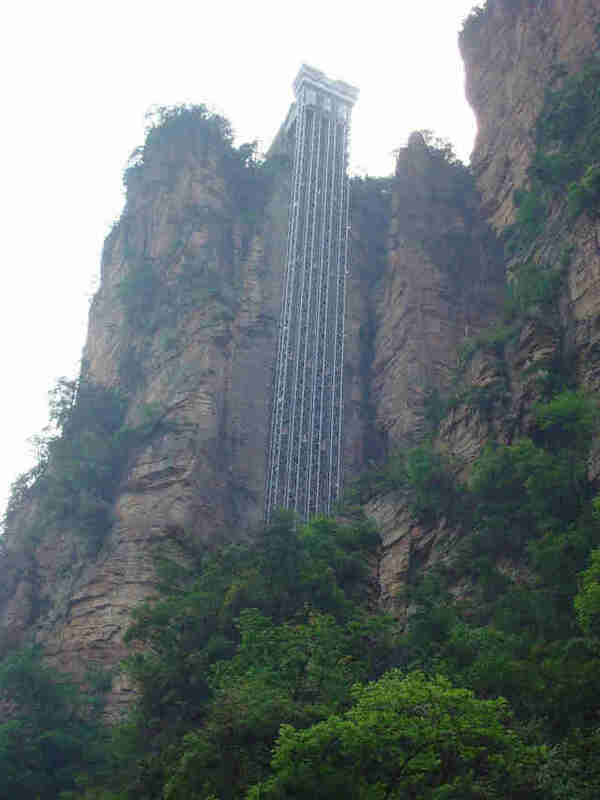 Built into the side of a cliff, this glass elevator climbs 1,070ft and offers crazy views of the Zhangjiaijie National Forest. Sure, it may have been built in what was technically declared a World Heritage Site, but what's more valuable: peerless natural beauty, or a big crazy elevator?